Situated on Edward St in the CBD is this building that backs onto the grounds of St Stephen's Cathedral; it is now known as The Catholic Centre. The building was constructed in 1900 for paper manufacturer and wholesaler Edwards Dunlop, who moved into their new premises on 1 January 1901 - the day of federation. On completion the building comprised four storeys and a basement, and included a lift and a telephone system. The architects were believed to be the Sydney firm of Slatyer & Cosh. 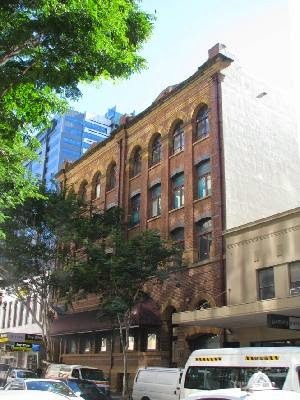 Here is a picture of the firm's Sydney warehouse, a heritage building still standing in Kent St, that was designed by architects Robertson & Marks. It was constructed in 1897 and you will notice the similarities. 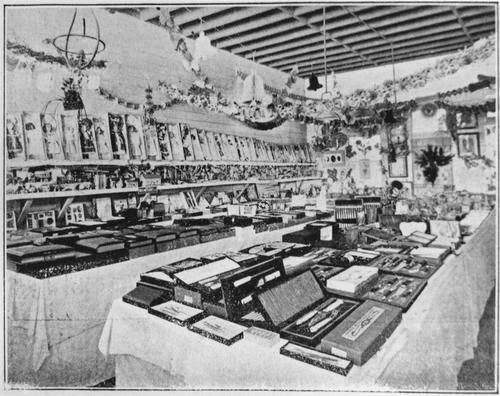 The company was founded by Frederick Lewis Edwards, a stationer, and William Phillip Dunlop, paper manufacturer, in Sydney in 1873 and they expanded to Brisbane in 1880. The firm quickly became Queensland's major paper manufacturer, stationer and newsprint supplier. Part of their operation was the use of commercial travellers to represent their products in country areas. Here is a picture of a sample room set up in Cairns by one of their salesmen. The Edward St premises were sold to the Catholic Archdiocese of Brisbane in 1975 when Edwards Dunlop moved their operations out of the CBD. In the 1980s the firm was taken over by Amcor Pty Ltd but the name was relaunched in 2001 following a merger with Commonwealth Paper. It is now part of the international IGEPA group. Is the building heritage protected? Otherwise the next owners may decide to pull it down for a car park. Or a fast food chain. Yes Hels, it is listed on Queensland's heritage list.